Our concert contest experiment continues with this refreshing news via Sweet Leaf® Tea. 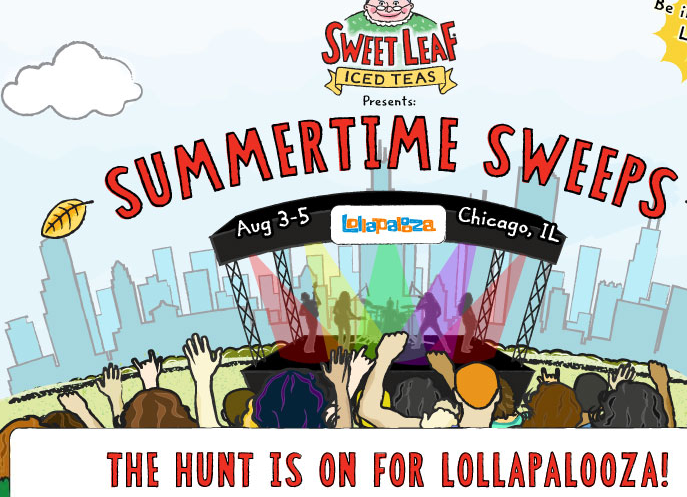 This week, and throughout the summer, they’re giving live music fans the opportunity to attend Lollapalooza for FREE through a simple Facebook promo when you enter based on trivia posted on the Sweet Leaf® Tea Facebook page. Two winners will receive VIP tickets, flights, hotel and airport transportation accommodation. One prize will be awarded each week and the contest starts June 4th and goes through July 6th. Enter the contest on the Sweet Leaf Tea Facebook page. And be sure to check out our previous Live Fix experiments about the 5 senses, brands and live music, concert fan stories and Lollapalooza. Good luck and stay tuned for more as we talk with Danny from Sweet Leaf on a upcoming episode of Live Fix Radio.